← Happy Women’s History Month! If you haven’t had a chance to read Escape from Beckyville: Tales of Race, Hair and Rage, what are you waiting for? 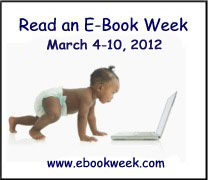 During Read an E-Book Week, I’m offering a 75 percent discount off the digital version of the book. Instead of $4.99, you’ll pay only $1.25. That’s much less than a slice of pizza or a cup of java, without the unwanted calories or caffeine. To take advantage of this 75 percent discount, click here and enter REW75 at check out! The special discount expires on March 10, 2012 at midnight. Thanks for helping me spread the word! I welcome intelligent debate and critique on my site. Unfortunately, I've had to moderate comments because of Trayvon Martin Derangement Syndrome and women who are offended by the word "Becky" (Not by Becky behaviors, mind you -- like trolling a black woman's website and being offended that she has the nerve to point out white privilege and racial microaggressions when she encounters them -- just the moniker.) This is a safe space for black women and our allies and if this offends you, find another site to troll. Sorry, my house. My rules. The Escape from Beckyville Tees Are Here! "Escape from Beckyville" in New Mexico, a set on Flickr.